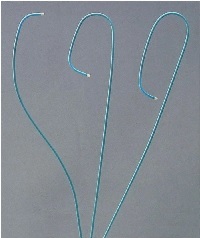 SoftNAV diagnostic catheter with hydrophilic coating and a larger I.D. In tortuous anatomy (for example, elderly patients, radial artery to subclavian artery approach, small blood vessels), many cardiologists experience difficulties and have to spend extra time passing through these tortuous anatomies, which means longer procedure time and more discomforts and pains to the patients. When they use our SoftNAV Catheter (hydrophilic coating), they can easily and smoothly pass through these tortuous anatomies, which means less procedure time and less discomfort and pain to the patients. Hydrophilic coating plays a big role in these tortuous anatomies. SoftNAV Catheter has a larger ID, which also makes a big difference for cardiologist’s hands. When cardiologist inject contrast media (for example Omnipaque) by hand injection for coronary arteries, they experience viscosity resistance. They usually inject a few times for coronary arteries to get good pictures, however, they usually do the cardiac catheterization on multiple patients each day. Therefore, toward the afternoon, they lose hand grip forces due to fatigue caused by heavy contrast media injections, and they cannot take good pictures. When this happens, they have to inject more contrast media and this causes side effects to patients and becomes more expensive. A larger I.D. helps to reduce the viscosity resistance, which means the hands are less tired and better pictures are taken.